I'm sure all of you are familiar with this color by now. 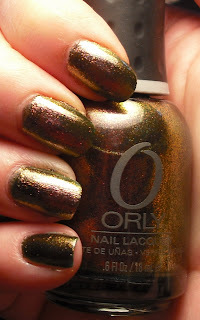 It is part of the Orly Cosmix FX collection. 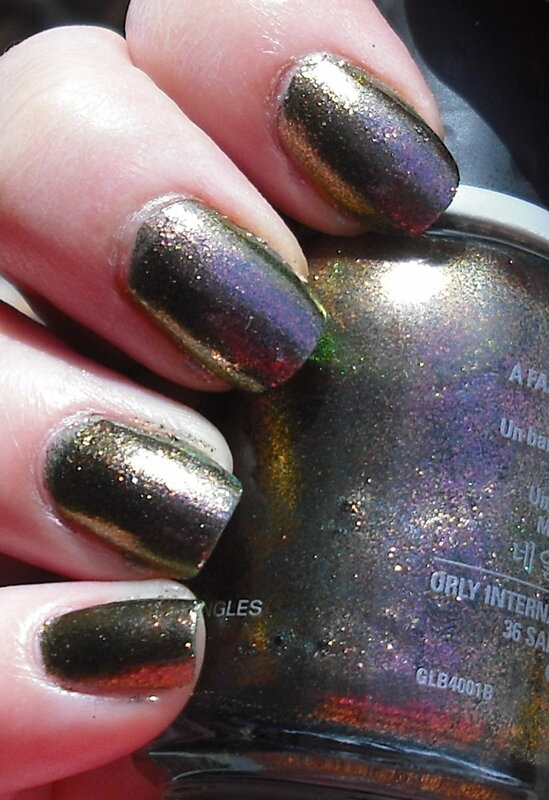 This is the only color I got from the collection because according to many bloggers the rest of them have dupes. I think Galaxy Girl is somewhat of an exception because the dupe of that one is an Urban Decay color, but that color didn't interest me. To see comparisons I recommend viewing Scrangie's post. I took many photos of Space Cadet because it truly offers you a rainbow of colors at every angle it doesn't matter if you're in the light or dark it's amazing! This is the color with flash. Here it looks like a smokey purple foil. This is underneath a lamp. It looks greenish-pink-gold. This is at another angle underneath a lamp. It looks olive-bronze here. Here again, is another angle under lamp. It looks like a rose gold or bronze. This outside in the sunlight. It looks like a greenish-silver color with hints of pink and gold. Finally this is in the shade. It looks greenish-purple-gold. I also cannot see how anyone could not find this color amazing! My dad is the exception I told him about this color and he said it looked like mold from the starship Enterprise on Star Trek. It's some pretty awesome mold then huh? These retail for $10 each. I would easily pay $10 for this. I wouldn't hesitate for a second. It is completely worth it. You don't have to pay $10 though! I bought this one off Transdesign for $5. Sadly, they are currently out of Space Cadet, but fear not Victoria Nail Supply has Space Cadet in stock also for $5! I'm sure Transdesign will restock again soon. If you can't get these online, like I said before I think it is totally worth the $10! I NEED THIS!! I've only looked at one Sally's and they didn't have it. Will definitely have to start the hunt for this one. I got this one and Galaxy Girl. I HAD to have Space Cadet!!! Just HAD to! And I've worn it for over a week. DROOL!!! I am into instant gratification so I got mine at the Altamonte Springs Ulta. You dad is quite creative in his description. love it! Megan- I hope you find it soon. I agree, you definitely need this. You won't be disappointed! rmcandelight-Good! I hope you get it soon and enjoy it! Freshie-Ugh I know I'm sorry! Bad Fairy looks amazing though. Thankfully, those other ones are dupres to the Orlys or else we'd be in more trouble! Kimberly-It's great! It's ok if I wasn't able to find it online I would of gone out the next day and spent the $10 on it. I like instant gratification too!